We will gladly accept returns for any standard stock¹ items for any reason within 30 days of date of purchase, provided the item is as new and of merchantable quality². (This excludes bespoke or customised³ shoes). If goods are being returned under guarantee or otherwise, because of a fault, please contact us ﬁrst, so as we can ascertain the cause of the fault and that it has not been caused by wear and tear, bad ﬁtting or other cause. Please make sure that you include the original Receipt of Purchase with your returns as well as ﬁlling out a Returns Form which can be downloaded here. You the customer are responsible for the return of the shoes. We cannot accept responsibility for the shoes until we receive them. We recommend you use recorded delivery. You the customer are responsible for the cost of return. We will refund the cost of the shoes, less delivery charges, where an exchange is necessary. In the event of an exchange being sought, delivery will be charged at current rates. We will refund the cost of delivery only where the goods are faulty when a refund is being sought. We will bear the cost of return delivery and original delivery only where items have been sent to you in error. 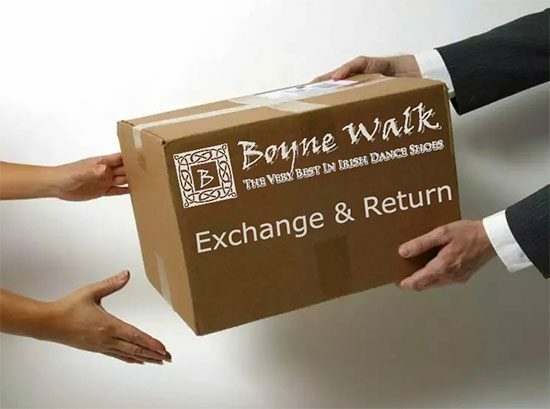 If you need an exchange quickly, we advise that you order the correct item online. We will refund the returned item when we receive it. We will make refund to the Credit/Debit Card used for the original purchase unless otherwise agreed. Returns being made from outside the Euro Zone should bear a customs label and should be marked “Returning to Manufacturer” in order to avoid related charges. We will not bear the cost of related charges due to this not being adhered to. Such items will be marked “Return to Sender” and delivery refused. ¹ Stock Item means items of stock that are available in standard form where no bespoke alteration was made at the customers request. ³ Bespoke or Customised means that the customer made a speciﬁc request for an alteration to the shoes when ordering.